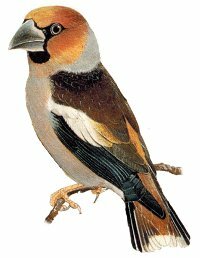 The Hawfinch is a large heavy bird with an extraordinary large bill, it's plumage is mostly brown and grey with bold white wing bars. 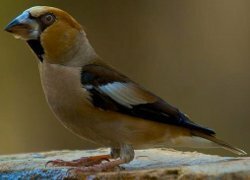 The Hawfinch is widely distributed throughout central Europe but is a localised breeder. Only 800 pair regularly breed and are resident in the UK and numbers are rapidly declining. Woodland, hedges, gardens and orchards. 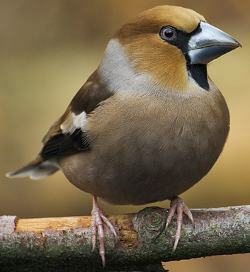 The Hawfinch can be a very elusive finch but if seen is unmistakable due to it's large size and bill. Brown wings, female is more grey. This image shows the birds large bill, bright brown head, black bib and grey nape. Note the distinctive white wing bar on dark wings contrasting with the light underside.